April Fools' Day is approaching and I'm sure many children and adults like to take the opportunity to play a little prank on someone. We have a great selection of traditional and classic jokes at Toyday, with of course the Whoopee Cushion being an all-time favourite. Another popular choice is the Bouncy Rubber Egg. I'm sure many people have been fooled by the realistic looking egg. 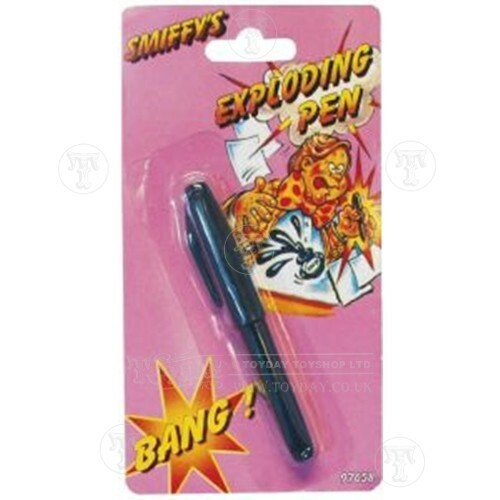 Probably the easiest joke to catch someone unaware with is the Exploding Pen. Just load it up, place it on a table and wait for your victim pull the lid off and find themselves shocked by the loud bang! You can view our range of practical jokes by clicking here. Let us know your favourite by commenting below! I love the exploding pen. I keep one loaded in my office drawer. Perfect for fooling temporary staff all year round!